Necrotizing enterocolitis (NEC) is the leading gastrointestinal emergency of the premature infant. In many cases, it happens in apparently healthy premature infants who have no other medical problems. Although it affects mostly premature infants, 10% of affected infants are born at term. Its incidence varies between 0.3 and 2.4 infants/1000 births and between 3.9% and 22.4% amongst infants of less than 1500 g. Males and females are equally affected. Most infants develop NEC within the first 2 weeks of life (KRasNa et al. 1996). Its precise cause remains unclear, but it is thought that factors such as ischemia, decreased mucus production, and diminished immune response of the premature infant may lead to invasion of the intestinal mucosa by intestinal flora resulting in air entering the submucosa and mucosa. Some experimental work suggests that translocation of intestinal flora across an incompetent mucosa may play a role in spreading the disease and systemic involvement. Such a mechanism would account for the apparent protection breastfed infants have against fulminant NEC (H0Rt0N 2005). The terminal ileum and the proximal colon are most commonly affected, though any portion of the intestines may be involved. 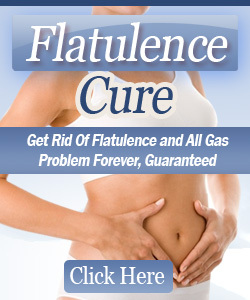 The clinical signs are nonspecific and consist of feeding intolerance, increased gastric retention, vomiting, abdominal distension, and the presence of blood in the stools. The mainstay of diagnostic imaging is abdominal radiography. Because of the possibility of perforation of the necrotic bowel, the supine film should be supplemented with a cross-table lateral or left-lateral decubitus radiograph. The radiograph findings of NEC are nonspecific, especially in early stages. Diffuse nonspecific gaseous distension and thickened bowel walls (suggesting edema/inflammation) is the most common pattern (FottER and SoRaNtiN 1994; KRasna et al. 1996) (Fig. 1.35). An asymmetric bowel air pattern or distension localized to focal loops only may also be seen. 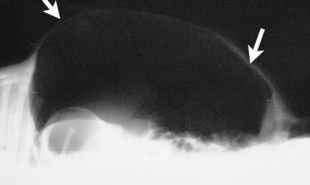 Radiographs can sometimes reveal scarce or absent intestinal air, which is more worrisome than diffuse distension that changes over time. 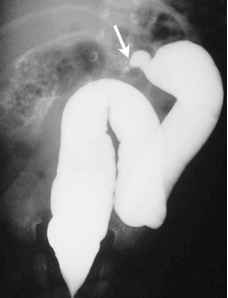 But the pathognomonic finding of NEC is pneumatosis intestinalis, consisting of submucosal or subserosal air (Bu0N0m0 1999). 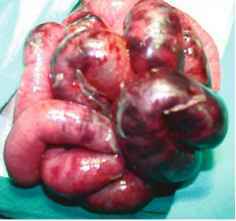 Pneumatosis intestinalis appears as a characteristic train-track lucency configuration within the bowel wall and may be linear or cystic (Figs. 1.36 and 1.37). The cystic collections are usually subsero-sal, whereas the linear form is usually submucosal. 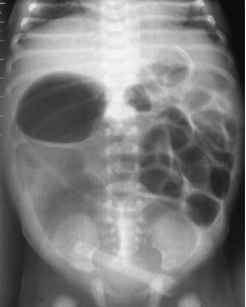 Pneumatosis intestinalis is due to the production of small bubbles of hydrogen by bacteria within the intestinal wall (AlbaNESE and Rowe 1998). Intramural air bubbles may also represent extravasated air from within the intestinal lumen. These changes might not be detectable on digitalized images due to the suboptimal resolution, and a printed X-ray film is often necessary (M0RRiS0N and Jac0bS0N 1994). 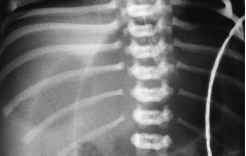 Serial radiographs help assess disease progression. Fig. 1.38. Pneumoperitoneum complicating necrotizing enterocolitis. 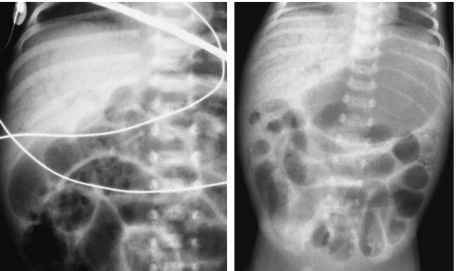 Supine in a 1-month-old premature infant radiograph shows intramural gas in the small bowel and free intraperitoneal air secondary to bowel perforation. The central lucency and the falciform ligament are observed abdominal cavity confirms it, bowel wall perforation might be present in the absence of free air in one third of the cases. Another pathognomonic sign of NEC is portal vein air. 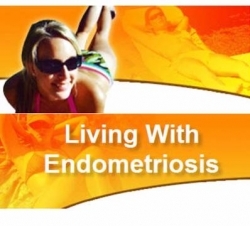 Portal vein air is more frequent and less ominous than was previously thought. It is seen as finely branching radiolucencies extending from the porta hepatis to the periphery of the liver (Fotter and SoraNtiN 1994) (Fig. 1.39). Ascites is a late finding that usually develops some time after perforation when peritonitis is present. 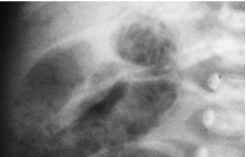 Ascites is observed on an AP radiograph as centralized bowel loops that appear to be floating on a background of density. It is better observed on ultrasonography (AlbaNesE and Rowe 1998). b a b hyperemia due to vasodilatation. Absence of blood flow in the bowel wall reflecting absence of perfusion to the involved loop, has been correlated with necrotic bowel (Faingold et al. 2005). 50%-75% with perforation have free air detectable on decubitus or horizontal beam radiographs. 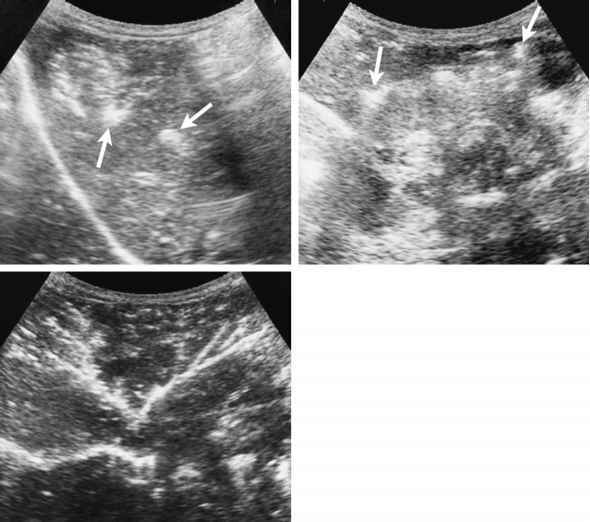 The presence of intraperitoneal fluid at US, particularly if it is complex or echogenic, is suggestive of perforation (Miller et al. 1993). About 20% of patients treated medically or surgically develop one or multiple strictures, at previously affected sites, especially in the large bowel. The strictures may be asymptomatic but also may cause bowel obstruction several weeks or months after the episode of NEC (Hofman et al. 2004; Pierro and Hall 2003) (Fig. 1.42). Strictures may develop even in patients whose NEC was not severe. Therefore, any patient with symptoms of obstruction after completion of treatment for necrotizing enterocolitis should undergo a contrast enema.